Latinoamerica Hosting Colombia Review 2019: Is Latinoamerica Hosting Colombia a Good Hosting? Latinamerica Hosting Colombia has a free website builder and latest security features but lag behind other hosting sites in offering unlimited hosting packages. onClick="trackClickout('event', 'clickout', 'Vendor Page - Visit User Reviews', 'Latinoamerica Hosting Colombia', this, true);"
Llevo con esta empresa 7 años y siempre me han ofrecido un servicio excepcional. Antes había contratado con otras empresas pero ninguna como Latinoamerica Hosting. Me encanta que siempre están ofreciendo nuevas tecnologías. Los recomiendo 100%. Muy buen servicio a bajos precios. La activación de los servicios se dio en menos de 20 minutos una vez hice el pago. La atención al cliente es muy rápida y ágil al momento de presentar inconvenientes. Hola,Tengo contratados algunos servicios con ellos desde hace aproximadamente 4 años y me parece un buen servicio. Siempre actualizan sus tecnologías y agregan nuevos programas. Sus medios de pago también son muy cómodos.Muchas gracias. As the name suggests, Latinamerica Hosting Colombia serves a Spanish speaking customer base in Colombia, Peru, and the rest of Latin America and the world. Since 2007, they have built a 15,000 customer base which is an indication of their commitment to providing quality website hosting services. There has been an increasing trend for non-technical people to have their own website, thanks to the ease with which one can create websites these days. Most people look for a free website builder when choosing a hosting company and if you are one of them, you are going to love their website builder. It features over 190 ready-made templates covering various themes from Art and Food to Travel and Personal pages. If the website builder is the reason you want to move to Latinamerica Hosting Colombia, you can utilize the free migration service on offer. As you would expect from any modern web hosting services provider, Latinamerica Hosting Colombia has moved on from SATA hard drives and adopted the faster SSD drives, hence enabling you to access your data fast and improve page load speeds. Irrespective of which hosting plan you choose, your data will be stored on these modern SSD drives. Your hosting account features the latest versions of PHP and many other programming and scripting languages but even if you aren’t technically knowledgeable enough to utilize these languages, you can opt for the Softaculous installer to install apps for you that utilize these latest programming languages. This way, you have access to the latest versions of popular software like WordPress, Magento, Joomla and many more. Free SSL certificates are available at Latinamerica Hosting Colombia along with CloudFlare. Both of these can be easily installed right from the control panel. Cloudflare should protect you against any DDoS attacks. The support for regular backups gives you added security in case anything goes wrong. The best aspect of the security of your websites is, however, the Imunify360. This incorporates the latest artificial intelligence to thwart any threats that could negatively affect your website or its visitors. The hosting packages are divided into H1, H2, H3 and H4 plans. The price shouldn’t concern you since all of them are reasonably priced. However, it’s the features you get for the price that you might want to consider. There are no unlimited storage and bandwidth packages, which is disappointing. The maximum you will get is 60GB disk space and 500GB monthly traffic. This should be enough for most people but those with multiple websites will have a hard time not exceeding this limit. The cheapest package offers only 5GB storage and 50GB bandwidth which makes it ideal for small business owners to have an online presence, but there’s not much a professional blogger or an online shop owner can do with these limited packages. Latinamerica Hosting Colombia has a blog on their website which is updated regularly with informative articles. The non-technical website owners will find it really useful to increase their knowledge. There is also a video tutorial section that they can use to learn more about how websites work. If you face any technical issues, you can create a support ticket or email or simply go to their live chat. Remote assistance through TeamViewer is also available. All these services are only available during working hours. To make things worse for English speaking customers, they offer the live chat only in Spanish. Just like their blog, their Facebook and Twitter pages are also updated regularly and are a good source of information as well as another way to get in touch with them. The limited packages offered by Latinamerica Hosting Colombia greatly reduce the chances of you staying with them when your websites become successful. As a starting point though, their packages are good enough and should fulfill your needs during the early stages of your website. 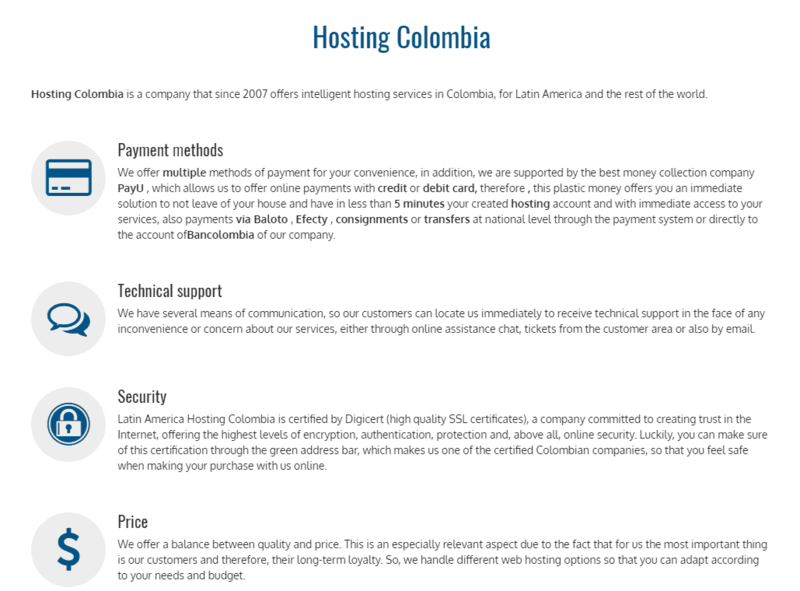 Wondering how Latinoamerica Hosting Colombia stacks up against other Web Hosting companies? Enter any other Web Hosting company and we will give you a side-by-side comparison.